Last year, I asked my food-loving friend Lauren if she’d like to undertake a culinary project with me. When I was small, my family made big-batch gifts all the time—jars and jars of homemade pickles or jam, preserved bounty from our garden, etc.—and often my Papa and Dede make ambitious trios for Christmas presents. One year: chili oil, Worcestershire sauce, raspberry vinegar. Another year: chili powder (Papa smoked the chiles), Herbes de Provence (Dede picked and dried the lavender), curry powder (Papa toasted and ground all the spices). Clearly, this is in my blood, but I live in New York City. Storage space is tight and I live far from at least half the intended recipients. A food gift seemed unmanageable. Still, the idea of covering all my gifting bases with one project stuck in my craw until I saw a blog post that showed a small child making vanilla extract. You guys, a child. I think we can all agree: I’m not going to be outdone by a four-year-old. Extract is a fantastic project to start out with. It is extremely quick, requires no specialty tools, can be done by small hands (see this blog post to see Annelise, my 4.5-year-old motivator, helping her mom—but don’t store your stash in the window! ), requires almost no cleanup, and results in a gift nearly everyone can use in a variety of ways. What’s not to love about vanilla extract? Commercial extract is made by soaking chopped-up vanilla beans in liquid that is at least 35% ABV (usually ethanol). However, sweeteners and colorants are often added, and the quality of the beans is not regulated. Blech. With this project, I could guarantee my friends were getting a quality pantry staple that would make their treats delicious all year long. Even better, when you’ve used about half the bottle, you can add more booze, give it a good shake, and your beans will keep flavoring the extract. It’s like the gift that keeps on giving! Did I mention it was pretty inexpensive? The cost per bottle drops as you make a larger quantity, and if you’re not mailing anything, it’s downright cheap. Lauren and I set up a date about a month before Christmas (more on that in a minute); in the meantime, I ordered the beans and bottles and whipped up a package design. After quick trips to pick up the booze and buy sticky labels, we were in business. I’d already run all our bottles through the dishwasher to sterilize them, so all we had to do to make the extract is cut up a couple of beans, shove ‘em in the bottles, cover them with booze, give ‘em a shake, and let ‘em sit. That’s it. Really. It took longer to stick our labels on the bottles and tie on the little hang-tags than it did to actually make the goods. Once you’ve got the bottles sealed, you should shake them every couple of days and let them sit in a cool, dark place for 2 months (I stashed mine in a cardboard box in my closet). Since we’d started a bit late, we just put tags on the bottles that explained both the “don’t use me until” info as well as the “how to replenish the bottle” tip. It worked perfectly! In January, I started getting text messages and emails from friends, saying, “Using the vanilla tonight in some cookies!” Just the other day at work, my executive editor mentioned she’s still enjoying her bottle. I use mine all the time, and every time I do, I get a little flutter of pride that I made it. You, too, can have this distinct pleasure. Even beyond the holidays, it’s great to have a few bottles of extract sitting around so I can give them as impromptu gifts, so I’d recommend tripling the recipe below (at the very least: Lauren and I made 40 bottles). Won’t you give it a try? Sterilize an 8-ounce glass canning jar and lid (or two 4-ounce glass bottles) by boiling in a large pot of hot water for 10 minutes or running through your dishwasher with the hot-dry setting [see update]. With a sharp knife, split each vanilla bean lengthwise, trying not to cut all the way through. If you’re using short bottles, cut each bean in half to fit. Stuff beans into jar or divide among bottles (the typical recipe is 2 beans per 8 ounces of booze, but I like to make double-concentrated vanilla). With a funnel or a small measuring cup, add vodka, making sure to cover beans. Seal jar or bottles. Shake vigorously and let sit in a cool, dark place for 2 months, shaking briefly but vigorously every few days. This recipe can be made in multiples, no problem. We made 40 bottles at once! Just do some basic math to sort out your ingredients. For 40 4-ounce bottles, we bought a 1-pound bag of beans and 4.5 liters of vodka. Note that your number of beans may vary, as produce never weighs the same, universally, due to size, water content, etc. For me, we got about 80 beans in a one-pound bag. You may find you get more/less depending on the variety of beans you buy, the supplier, etc. Some people make the vanilla in one big canning jar (say, a quart or larger) and then, once the beans have released all their delicious flavor after 2 months, they transfer it to smaller bottles for gifting. This works fine, but it means your recipients can’t make more vanilla in their own bottles. You, however, can make another batch using those beans that are still in your big jar. You must do what you think is right, of course. 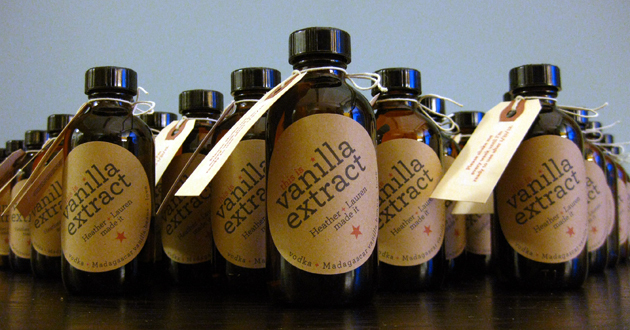 If you take your time to make your vanilla, just include a note on the bottle saying when it’ll be ready to use! UPDATE: My awesome friend Dora just made vanilla based on this post. The lids on her bottle caps had paper liners inside and when she washed the lids, the paper began to peel. She boiled the lids extra long so she could peel out all the paper and glue. I did not sterilize my lids, I think, because I did not encounter this. The paper liners in some tiny bottle lids help them stay watertight, so if you have paper lids in yours you may want to just rinse them briefly and trust they’re clean, since they came from the manufacturer. Sterilize canning jar lids and others without paper liners in the normal way. Booze: Vodka, though Bourbon also works well. Note that vodka bakes off cleanly, whereas Bourbon leaves behind its own flavor footprint in your baked good, delicious in its own right. It’s best to avoid the crappiest vodka, but you don’t need to go crazy. We bought Wódka Vodka, which is generally well-reviewed and has a great price point. Labels: We used these 2.5″ round kraft labels from Avery (22808), but you can use anything you like. One note is that printing them on a photocopier or with a laser printer is better than using an inkjet, because inkjet stickers will bleed if grabbed with wet hands. A note about shipping: It is illegal to mail alcohol through the USPS. I’m definitely not telling you to do it. But if you mail yours through other carriers (or just break the law), make sure you wrap your vanilla in several layers of bubble wrap and they should survive the trip without worry. These 4x4x6 corrugated boxes from Uline fit those 4-ounce bottles perfectly, once I’d bundled them in several layers of small bubble wrap. Got here via your LJ and I love this idea! I made a friend a “pho to go” basket two years ago as a Christmas gift. I took all the spices needed for pho broth (purchased on the cheap at my local farmer’s market) and divided them up in to small portions and put those portions in to make-your-own-teabags bags and wrapped them up, added a large package of rice noodles, and put in a jar of Better Than Bullion mushroom concentrated stock (she’s a vegetarian). For extra homemade goodness, I could have made the stock, but I was in a rush. Just drop some noodles, a spice packet, a tablespoon of broth, and any protein additions you want in some boiling water and voila… pho! It might be too much to ship, but since she lived next door, I just handed it over and it was a hit. Maybe this year will be the year of vanilla extract gifts! I LOVE the idea of pho to go! (1. Excellent name. 2. Tasty. 3. Something no one else will give!) It might be fun to spend a day making vegetarian pho broth (with all the spices in it) and then reduce the holy hell out of it and pressure-can it in small jars. My Papa reduces his broth to an extraordinary degree and then freezes it in ice cube trays, but I know you can make it shelf stable if you use the pressure canning method. Slow-cooked pho broth is the absolute best. MMMMM! You’ve inspired me to put pho on the menu for next week. Good to see you here, Lizerati! We decided to make this a family project, so my 4 yo daughter can help cut the beans with scissors. The bottles and beans arrived today! Should be enough time to have them ready by Christmas. Thanks for the great gift idea. Chris, that sounds like a great family project! I always loved helping out, shoving cucumbers in jars so we could pickle them (or whatever the project was). I know your daughter will feel the same. Kids love being involved in the grown-up projects! Let me know how it goes. So you only used about 4 beans per cup on vodka? I’ve had a bottle brewing for about six months with about that ratio going on and it still smells more boozy than vanilla-y. I’m not in a rush or anything… I just throw the husks in there after I’ve used most of the seeds for a recipe. Sara, yup, I do! I’ve been using my vanilla for months and haven’t noticed an appreciable difference between it and commercial vanilla, in terms of strength. It does seem a bit lighter in color but that’s because commercial vanilla is often dyed, and it’s also not sweet at all, which is due to there being no additional sweeteners. It took me a bit to get used to the smell of homemade extract vs. standard stuff you buy at the grocery store — they definitely smell different. Have you tried using the one you’ve been brewing? I bet it’s going to taste divine!